I believe the late season is the most challenging season to dress for. 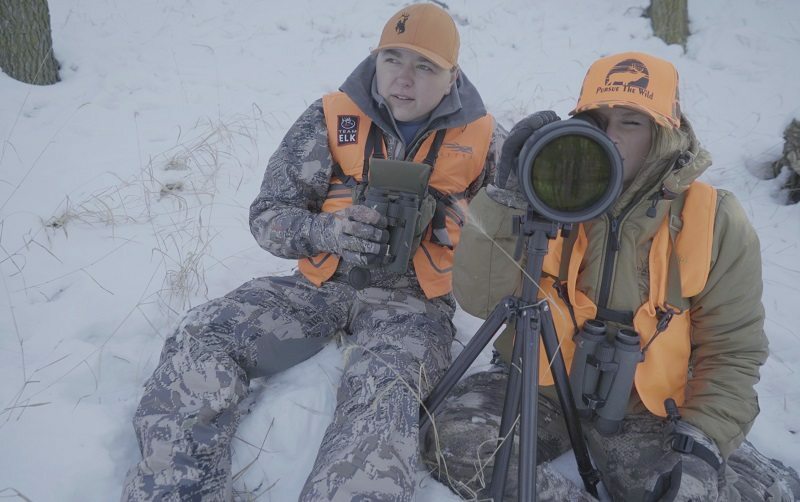 The temperatures have dropped, there’s usually at least a few inches of snow on the ground, and the wind is whipping almost every day, making it tough for any late season hunter to stay focused behind the glass. We’ve all heard that the key to staying warm is to stay dry, so in situations of sitting in the snow and being out in the elements, we turn to our rain gear. While “traditional” rain gear will keep the moisture at bay, you are still dealing with the non-insulated fabric that doesn’t necessarily trap the heat into your body. 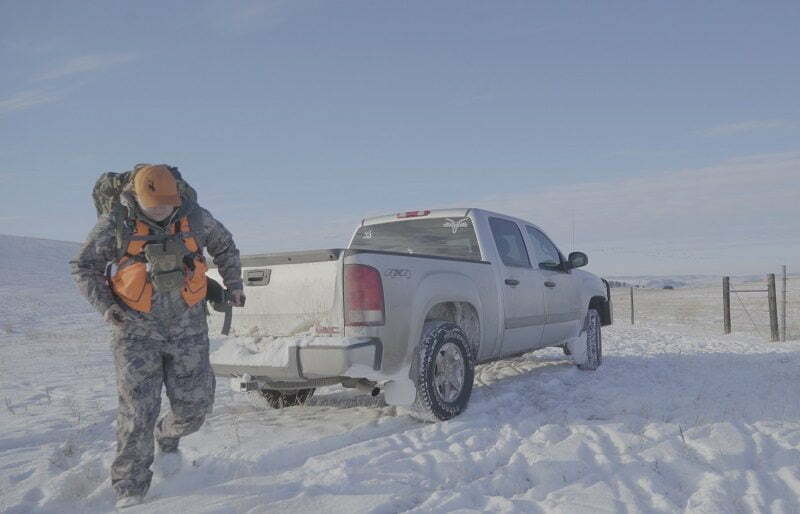 That was until Sitka Gear introduced the Coldfront Jacket and Pants. 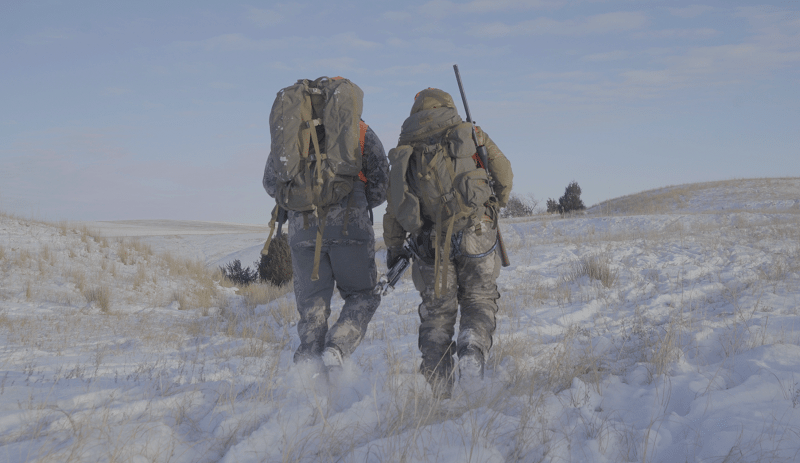 I was scheduled for hunting and filming in the later mountain seasons and the Midwest in December of 2017, so I was on the search for outerwear garments. 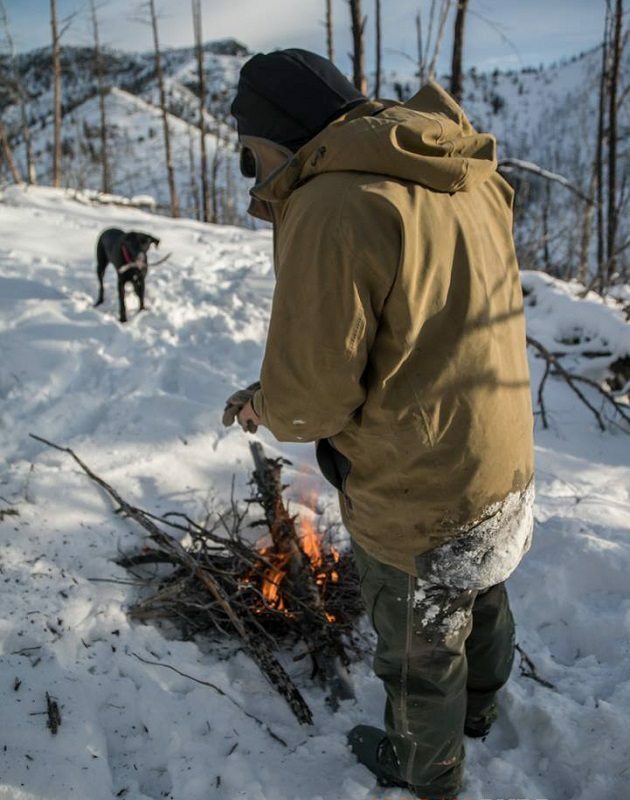 When I heard about the Sitka Coldfront jacket and Coldfront pant, I knew I was on to something. 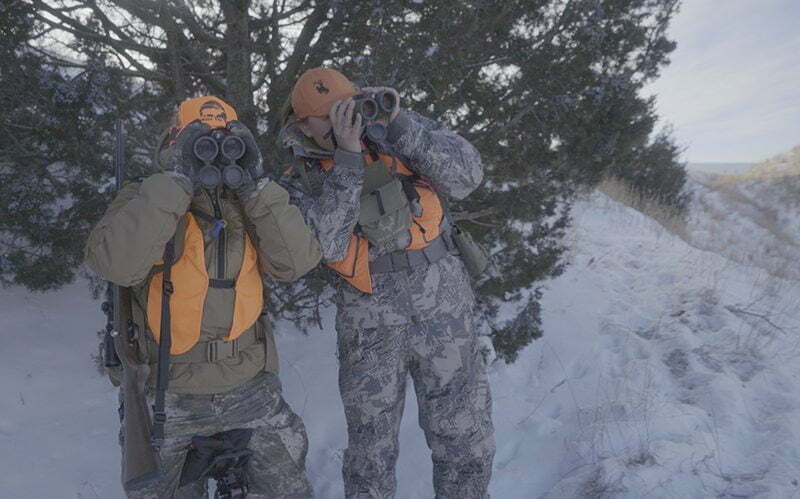 The Coldfront series is a three-layer Gore-Tex soft-shell system that is both 100% waterproof and windproof. What makes it the ultimate late-season set for me is the microgrid fleece backing that works to trap in your body heat much more than traditional rain gear. The jacket has become my go-to outerwear top for the late season. The longer and reinforced tail make it near impossible for moisture or wind to find its way up your back while bent over or just sitting in the snow. The cuffs are rubberized and have Velcro adjustments so you can get a tight seal from the elements and make them fit comfortably underneath gloves. I’m very happy with the pocket placement as well. The two lower hand pockets have the grid fleece in them, too, so they retain some heat with hand warmers. The and the chest pocket fits my phone perfectly. 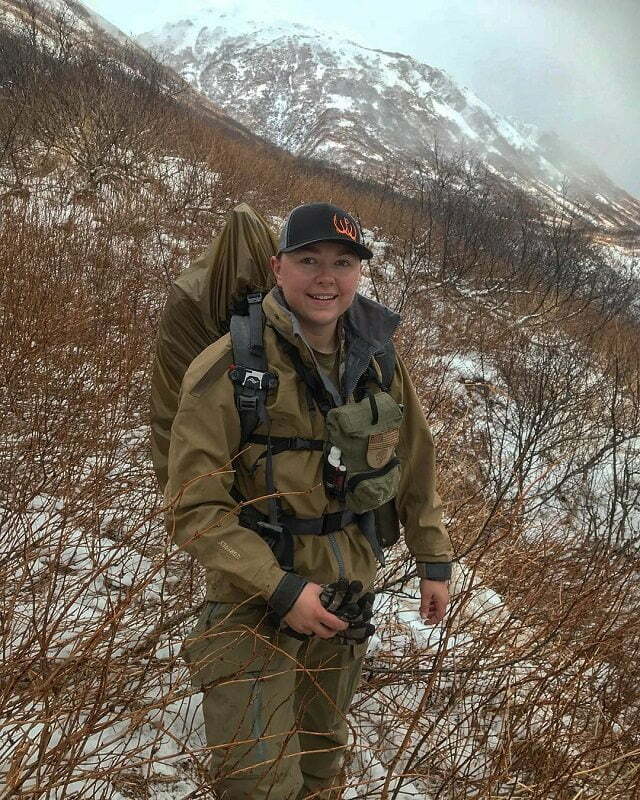 The two upper hand pockets, that are not grid lined, are strategically placed; Sitka was brilliant in coming up with the idea of putting pockets fairly high on their rain jackets. This design puts your elbows below your hands. In a rain or snow storm, moisture runs off of your elbows instead of into your pockets. The jacket also has a hood that rolls up and zips into the collar when you don’t need it but quickly unzips and unrolls when needed. The main zipper is a very heavy duty and the pocket zippers are pretty substantial and weather-tight as well. I usually wear a large in all Sitka Gear. This jacket is a little large until you get your layers underneath, then it’s perfect. They lengthened the arms as well for more coverage. The jacket currently comes in two colors, Dirt and the Open Country pattern. Both weigh in at 34oz in a size large and retails for $649, per the Sitka website. The pants didn’t let me down either. They are designed with the same micro-grid fleece and Gore-Tex features as the jacket. I would classify these as a pant-bib. They feature a low profile pant front, but the back is high profile with sewn-in suspenders. This way, when bending over or sitting in snow, moisture and wind never have a chance to get in. The seat of the pants is also reinforced for durability. Both sides of the pants have full-length zippers so they are very easy to take on and off. The side zippers are also two-way; with the pants on, you can still pull down the top zipper and get into your main pants pocket underneath. The two front hand pockets are grid fleece lined with watertight zippers and are awesome for hand warmers. There are lower thigh pockets that sit at an angle which are also very handy. I usually get a 34T in Sitka pants and the large fits me with some extra room, as well as extra length in the legs. The pants are currently offered in the solid color Lead and the Open County pattern; both weigh in at 36oz in a size large and retail at $599. I also got a pair of the gloves to try and while I do like the construction and feel of them, I would consider them a mid-weight glove and not a heavyweight glove. They are constructed of high gauge nylon with a seamless knit liner. The inside has a warm high-density fleece, with Primaloft lining and a three-layer Gore-Tex membrane. The Velcro adjustable cuffs seal from the elements and get a tight fit around your jacket or shirt sleeve. 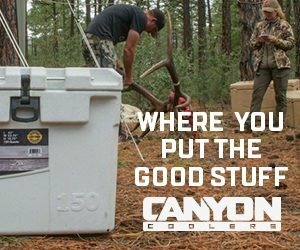 They come in at 7oz, are available in the new Sub-Alpine and Open Country patterns, and list for $149. The first trip I took the Coldfront set on was to Kodiak, Alaska the first week of December. We did a lot of four-wheeler riding and long periods of glassing in the snow and wet weather. On the four-wheeler rides, I would slip the pants and jacket on over top of my other layers and they kept me dry and warm while splashing through puddles and driving through wet brush. When sitting in the snow, the extended back on the pants design really stood out to me, as well as the long tail on the jacket. Snow couldn’t make its way up my jacket and into the back of the pants no matter how much I moved around. When we would find animals to stalk, I knew the Coldfront pant would be too warm for the hike so I would take them off and leave them at the four-wheeler. I packed a pair of the Stormfront pants in my pack that served as my rain pant if we were to get stuck in a storm away from the four-wheelers. I could have packed the Coldfront pant with no issues if needed. While hiking with the jacket, I made sure to have only base layers underneath so I wouldn’t overheat as quickly. The second trip I used them on was in my home state of Nebraska chasing deer. I felt these conditions really challenged the set. We encountered about a foot of snow the whole time, with snow flurries a couple of days, high winds and a balmy 20 below zero windchill average. I layered basically the same as above and still had great luck with both the jacket and the pants. One thing about the pants, which is normal for rain gear, is it’s pretty restrictive. There’s no stretch to it and it shortens my stride quite a bit when walking very far in them. Common attribute to rain gear in general but I wanted to note it. The cold wind on this trip would almost take the breath out of you, but I absolutely loved how well the jacket and pant blocked the wind. The Wind Stopper jackets did a pretty good job, but there was a sizable difference when compared to the Coldfront jacket. Once again, I didn’t have any issues with moisture leaking in or any durability problems. One potential issue that has come up is the loudness of the pieces. They do have a dull crinkly sound to them right out of the box, that would make a bowhunter leery. After talking with a number of people that have the pieces, the problem diminishes with use. Something I’m a big fan of with this set–and Sitka in general–is their selection of solid colors in most products. With the Coldfront, I see this as much more than a hunting jacket and pant. I believe it would be a great set to snowmobile, ski, snowboard, ride four-wheelers and horses in when the weather is cold. They both are an all-around fantastic bomb proof product for when the weather takes a turn. Overall the jacket and pant performed great for me and I don’t see myself taking them out of my late season kit anytime in the future. I truly don’t have too many cons for this set, but I do think the price will be a deal breaker for a lot of people. At around $1,250 retail for the jacket and pant, that is a serious investment for a lot of people, including myself. As I noted above, this is much more than just a hunting jacket and pant. There are a ton more applications that these would excel in, and is why I also recommend considering a solid color. I really believe that this is a jacket and pant that, with some care, would last you a lifetime. You can comment on this article or ask Jordan questions here.